The MetLife Stadium in New Jersey was treated to two of English football’s heavyweights, Manchester City and Liverpool, going head-to-head in what promised to be a thrilling encounter. Both sides had first-half penalty shouts as Andy Robertson brought down Luke Bolton and Cameron Humphreys likewise to Curtis Jones, both being stonewall penalties. Leroy Sané opened the scoring with a clinical finish in the second half. Mohamed Salah then arrowed a header past Joe Hart, albeit from an offside position, but the goal stood. Tosin Adarabioyo then fouled Dominic Solanke resulting in a penalty calmly slotted away by Sadio Mane. 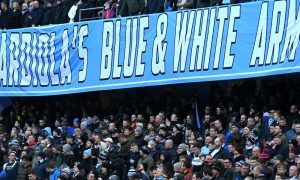 Although Liverpool were victorious, City’s put up a very good fight and displayed many youthful prospects who can leave with their head held high. Bravo wasn’t called into action much in the first half he played, distributing well on the whole, despite a couple of wayward long ball attempts. Bolton featured at right wing-back tonight and did so brilliantly. He was able to push on and offer what was lacking in the preceding game against Borussia Dortmund: attacking intent. Bolton caused constant problems for Robertson, as he forced him into a challenge that should have been a penalty. He showed his defensive attributes with some hard-hitting challenges, none finer than on ex-Blue James Milner. Following a fantastic display against Borussia Dortmund, Garcia looked just as assured on the ball in the middle of a back three, displaying some fine positioning to read the game very well and knowing when to commit to a tackle. He did so in multiple duels with Daniel Sturridge, where he came out triumphant. Garcia produced his second man-of-the-match displays in as many first-team games for City, surely, he has pushed himself up the pecking order to provide Pep Guardiola food for thought. Humphreys did at times look rather clumsy as he gave away multiple unnecessary fouls for over-committing to a challenge. However, he did make some very important blocks to potentially save two goals. Not much to note on Denayer’s performance. He moved the ball well and continued to look confident on the ball despite pressure from Liverpool’s frontline. Harrison played his part in the game at left-wing-back, surely a career-first for himself. Despite the unusual positioning, he worked very hard to get up and down that flank, but the majority of the attacks did go through the middle, so he wasn’t too involved in that department. Despite a poor performance against Dortmund, Zinchenko did start again tonight and looked a completely different player. He was very sharp in possession and like Garcia, dictated the play from deep in the midfield. In the second half, he was moved to the left of a back three, but he didn’t look largely out of place, continuing to aid the build-up from the back. Foden kept possession and moved the ball quickly and often to the right places. Unfortunately, he didn’t display his nature to drive forward with the ball into attack and finding the killer pass. He was still intensely pressing approaching the 90th minute, reflecting his desire to show his worth to Guardiola. Diaz looked a considerable threat in the first-half. The Spaniard drove forward with the ball, threading through some lovely passes and creating numerous chances, the best falling for Bolton as part of the penalty shout. It’s certainly saying something that often the only way he could be stopped, was to be brought down. Mahrez showed glimpses of why he has been so heavily sought after by City. His trickery and ability to glide past players was at hand alongside a sumptuous passing range. He could have released the ball more when there were opportunities to play his new teammates through but barring that it was an imposing performance. Nmecha got another 45 minutes under his belt of first-team game-time and impressed yet again. He came very close early on when forcing a save out of Karius, but he couldn’t take advantage of the rebound. His main quality shown was his remarkable hold-up play as he held-off Virgil van Dijk and Joe Gomez on multiple occasions, waiting for other teammates to join him in attack. Considering Bernardo came back from his holiday as a result of the World Cup early to join-up for pre-season, he looked very sharp. His silky footwork was on display alongside his vision as he slipped through Sané for the opening goal of the game. City’s new highly-rated prospect had a rather mixed debut. He displayed his ability to accurately break the lines in the build-up for Sane’s goal and looked largely calm on the ball, changing direction with ease. However, his rawness shone through at times with two hasty challenges that gave away free-kicks in dangerous positions, showing that despite his incredible potential, he still has a long way to go aged just 18. 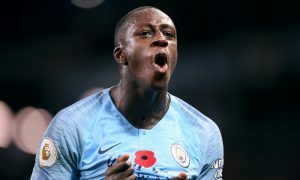 Sané came on as the furthest forward in City’s 3-1-4-2 system and looked to have an early goal as Bolton fed him the ball across the face of goal, but he couldn’t provide the finishing touch. He soon made up for it as his blistering pace allowed him to latch onto Bernardo’s ball and finish this chance accordingly. Hart was left helpless for Liverpool’s goals and did well to prevent others from occurring as he came out to pounce on a loose through ball to Salah and closed down the Egyptian’s angles well when he hit the bar on another occasion. 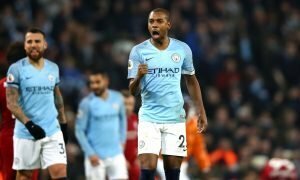 Adarabioyo struggled in his 30-minute cameo where City’s influx of youngsters to the pitch didn’t allow for much coherent build-up in the latter stages. When he was called into notable action at the back he made a clumsy mistake to give away a last-minute penalty. Roberts played in both wing-back roles and certainly suited the right flank a lot better. He did run at his counterpart Alberto Moreno and cause problems, but no concrete chances resulted from it. Dele-Bashiru struggled to make an impact during his substitute appearance and could influence the game more from the beginning if he was provided with a start on Sunday. Garre came on at left-wing-back and did get down the line and cause some problems for the Liverpool backline. The Argentine is another player whose influence could be more promising if he was to start.